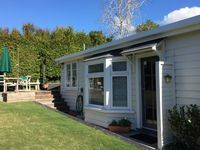 Properties in Matiatia Bay average 4.6 out of 5 stars. Sea Views in Boutique Vineyard, close to Oneroa. Property 2: Sea Views in Boutique Vineyard, close to Oneroa. Property 7: Studio 33. Sunny and spacious by Oneroa Beach. Property 20: Enjoy a carefree comfortable and well appointed holiday accommodation. Property 34: Designer 1 Bedroom House With Stunning Sea Views! Property 41: Stylish waterfront retreat - dramatic 180 degree views! Our hosts were very accommodating and gave us full privacy at all times. Would happily book again when we are back in Auckland.